I’ve spent some time pondering that. I’ve never been more than a curiosity to my non-frugal friends. Maybe they were kind enough to wait until my back was turned before twirling their fingers around their ears. But what about when it starts to get uncomfortable? When you start to live On The Fringe of Polite Society with your hippie ideas? The horror in people’s eyes when I talk about not spending another penny on shampoo. My abject disdain for all things disposable (seriously, WHY should I pay for something, only to have the privilege of throwing it away?). Once, after watching a friend’s reaction to my topic of homemade, reusable sanitary pads, I swore I’d try to mainstream my frugality, if only in public. But those pennies you save through extreme measures have a way of adding up pretty quickly. Eventually, what was uncomfortable becomes commonplace. You’ve just learned to live a little cheaper- time to find a new way to get uncomfortable again. If I write something that causes you to grimace, that may be a good place to start. In the meantime, write yourself a check for the money you didn’t spend on Kotex or Pantene and open up a savings account in your local credit union. Watch those savings accumulate and gather interest. Dream of something realistic and achievable you want, and make that your goal. Envision it when things are uncomfortable. Our goal is Disney World in 2 years. Our plan is to make it a reality through frugality. 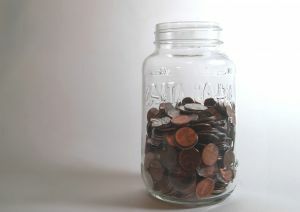 What are you saving your pennies for? What extreme measures have you gone to in effort to get there? Hmm I wish I could say that we have all sorts of extreme behavior. Unfortunately, between my fatigue and Tim’s ADD, there isn’t a whole lot we can manage. But we do our best. We save all our change, not that that’s all that extreme. We had been saving it in a Spiderman head bank (“feeding Spidey” we called it) but now that I got Tim a Darth Maul bank for Christmas, he tends to use that. Music comes on (along with light-saber noises) and the figure moves around in fight stances. It’s pretty hilarious/awesome. I’ve also been trying not to buy paper towels, which is sometimes very annoying, but instead use dish towels and such to mop up spills. More eco-friendly and frugal all at once. 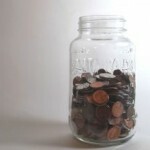 .-= Abigail´s last blog ..Emergency funds: Yea or nay? =-. Great job speaking out or writing out on this topic. It's ridiculous the social pressure to spend money on needless things like disposables or strange shampoo concoctions. I try to be as open as I can on my blog . . .in the hopes of counteracting this pressure, but I admit that I have some friends that I probably wouldn't tell about my no shampoo ways or my recent decision to ditch the disposable feminine hygiene products. But those same people I don't come clean with are the same ones who say things like "It must be nice . . ." when I talk about some of the options my husband and I have because we don't waste our money. I love this post… I went to Target over the weekend to pick up some much needed girl products for myself. I thought I would spend $25-30 and the bill came to $60!! I just about fainted. I can probably live with homemade shampoo and reusable sanitary napkins but I’d REALLY have a hard time without my face lotion (w/SPF) and sunscreen. I am extremely fair and use sunscreen everyday. On the subject of people judging. I have endless fun telling people that I don’t own a dryer and don’t plan one buying one. I live in L.A. for goodness sakes, drying clothes is not very difficult. People just can’t fathom the idea of the inconvenience of hanging clothes??? .-= Tina Delany´s last blog ..I got the fever baby! Spring Fever! =-. I do coupon, use some retro cleaning techniques, DIY some stuff, … but there are a lot of people who out-frugal me on all of those efforts. So my steps really don’t seem extreme! However, our current goal is finishing the renovations on our house. We moved to our home six years ago with the expectation of completing the painting, hardware upgrades, and basement renovation within a couple of years. That schedule dragged because of financial issues. We’re back to working on the “to do” list. .-= Monroe on a Budget´s last blog ..When is the next grocery class? =-. Excellent post! I am just starting out in community management/marketing media and trying to learn how to do it nicely – resources like this post are incredibly helpful. As our organization is based in the US, it?s all a bit new to us. The example above is something that I be concerned about as well, how to show your own genuine enthusiasm and write about the truth that your item is useful in that case.